Waste and corruption continue to plague many union locals, sapping resources from the union movement and leaving workers to pay the price. Inadequate union disclosure laws help create the atmosphere in which these abuses thrive. In 1999, workers at AFSCME District Council 37 in New York learned that over the preceding four years their union had been shortchanged by its leadership to the tune of $4.6 million. The workers of DC 37, who earn average annual salaries of around $27,500, paid for such items as a $345,000 catering bill for an event in Chicago, $135,000 for a car leased by the president of a union local, and $141,000 for travel, food, and drinks when DC 37 President Stanley Hill attended AFSCME's Aloha Conference in Hawaii. (A $1,081-per-night hotel room in Hawaii, where Hill and his wife stayed for eight nights, was complimentary.) While this was going on, DC 37's funds dropped from $20 million to $3.5 million. Adding insult to injury, investigators learned that DC 37 officials had rigged the vote on a contract with the City of New York. While this level of abuse has not been uncovered in Michigan's public-sector unions, the same combination of mandatory dues and minimal oversight that contributed to the DC 37 debacle in New York exists here, and offers the same temptations and opportunity. Certainly Michigan union officials are well compensated. 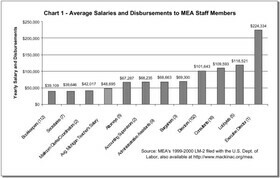 The MEA, for instance, has 125 officers and staff who receive over $90,000 per year in salary and disbursements, compared with an annual average teacher salary of $48,695. 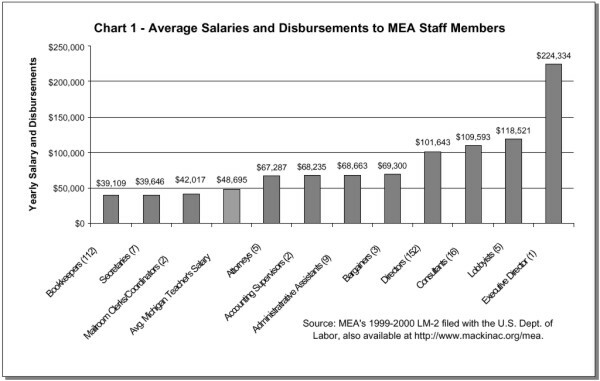 Chart 1 compares average salaries and disbursements for MEA staff to the average Michigan teacher salary. 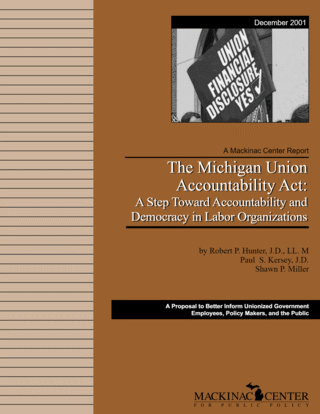 Michigan unions still contend with their own corruption problems. Recently the International Brotherhood of Teamsters was forced to remove Michael Bane, the President of Local 614 in Pontiac for giving misleading testimony about his involvement with three suspected mob figures. Teamsters President James Hoffa is a member of Local 614 and a close associate of Bane. The Bane incident suggests that the Teamster's continue to struggle with organized crime, even as they argue for the termination of a federal review board charged with investigating and cutting mob ties. Even more disturbing are reports that some local officials of the UAW are allegedly beginning to collaborate with the automobile manufacturers, lining their own pockets in the process. A Detroit Free Press series in May of this year described rank-and-file worker suspicion that union officers had been paid off by General Motors and Daimler/Chrysler. Workers claim that the automakers had paid UAW leaders for hours they did not work, or hired relatives and friends of UAW officers. In exchange, it is alleged, the UAW agreed that it would not follow up on worker grievances. At one point, UAW members allege, officers of Local 594 in Pontiac extended a strike in order to secure GM jobs for their relatives. A spokesman for GM declined to comment on the allegations for purposes of this Mackinac Center for Public Policy report. The UAW also operates joint funds with each of the Big Three automakers for the retraining of laid-off workers. The funds were set up in the early 1980s, when recession and foreign competition led to large-scale layoffs, then expanded tremendously when the automakers recovered and prospered. The joint funds have made questionable expenditures, such as sponsoring NASCAR racers Bill Elliott and Casey Atwood (sponsorship of a NASCAR racer costs between $8 million and $16 million annually) and two NASCAR races, the UAW-GM Quality 500 and the UAW Daimler/Chrysler 400. The autoworkers' union also teamed up with Daimler/Chrysler to put on a "Hollywood Showcase" at the 2000 Democratic National Convention. A UAW-Ford conference in Las Vegas reportedly drew 3,000 delegates and guests. Meanwhile, press reports indicate that workers who raise questions about relationships between UAW officers and the auto companies have received threats and been ostracized by coworkers. The UAW once had a reputation for policing itself reasonably well: "Those gripes stayed in the family and the offenders got slapped hard by the international," according to Bob King, a former UAW official. But an apathetic response to the latest round of accusations has forced workers to take their suspicions to federal investigators. Billy Robinson, president of Local 2036 in Henderson Kentucky, was harsh in his assessment of where the union is going: "The UAW has become a company union. . . . They don't represent the members. The Big Three have bought off the union, paying representatives 70 hours a week to ignore their members." If Robinson's fears prove to be true, the return of the "company union" could be a disaster for workers, and represent a tremendous failure for modern labor law. The entire scheme of state and federal labor policyof exclusive representation and agency feesis designed to foster powerful unions with the resources to deal with the management of large corporations from a position of strength. The national law contemplates independent labor organizations whose sole focus is the improvement of workers' wages and conditions of employment. The abuses outlined above are a small sample. The National Legal Policy Center runs a bi-weekly summary of union corruption stories on its web site at www.nlpc.org. The number of articles is staggering, and Michigan, sadly, is well represented. Let's Fix the Law on Public Sector Union Corruption, Ken Boehm, Capital Research Center, http://www.capitalresearch.org; Union Corruption Update, May 21, 2001, http://www.nlpc.org. Ex-Officials of City Union Convicted of Rigging Vote, Steven Greenhouse, The New York Times, July 26, 2000. Michigan Education Association IRS form 990 filed for 1999.